In the early 24th century of the First Era a trove of iron ore was found beneath the hills of northern Glenumbra by the celebrated Pinifred Lode-Finger. A great mine was delved to dig out the ore, and the town of Crosswych was founded to house the miners. The Crosswych Mine is a mine in the north part of Crosswych. The first time you enter the mine or indeed any part of Crosswych, it will be inhabited by Red Rook Bandits who have taken over the entire town. 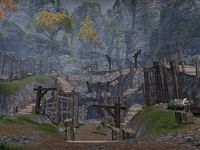 Only by completing The Miner's Lament and the other related Crosswych quests, will the mine be inhabited by free workers once again. Dotted around the mine there are several nameless workers who may make a remark upon your passing. If the related quest has not been completed then there will be some townsfolk inside the mine, being forced to work by the Red Rook Bandits for their resistance against them. This page was last modified on 19 November 2018, at 06:38.